Uhlmann umbrellas have been made in Germany for roughly twenty years, and their impressive standards can be seen in their products, found worldwide. Their superb design, expert engineering and precision manufacturing made them the choice of European customers who demand the best. The tried and tested telescopic system and state of the art gearbox situated within the mast, provides maximum stability, functionality and durability. 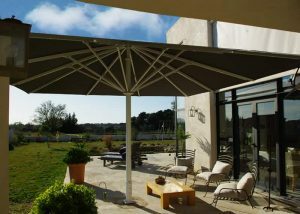 It is operated by crank handle or pin, whereby the frame is raised when closing, so that, with few exceptions, Jumbo umbrellas can be closed above table height.Adjustable, spring-loaded end pieces in the arms ensure automatic re-tightening of membranes as well as quick and easy cover changes. Depending on your individual requirements, Jumbo umbrellas can be installed using concrete foundations with in-ground sleeves, base plates or portable bases. A spectacular variety of sizes, outstanding craftsmanship and a broad range of accessories make this umbrella first choice for most solutions. With sizes ranging from a simple five metres squared, up to a gigantic 26 metres squared, these umbrellas really live up to their name. 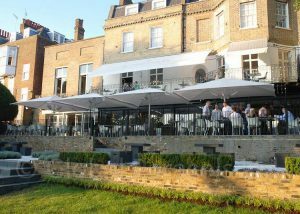 With huge sizes available, plus a strong and sturdy build quality, these umbrellas are particularly useful in commercial sectors such as hotels and restaurants. The frames consists of an extra strong aluminium frame with struts, and as standard it comes with a white powder coat finish. Other frame colours are available when made to order though. 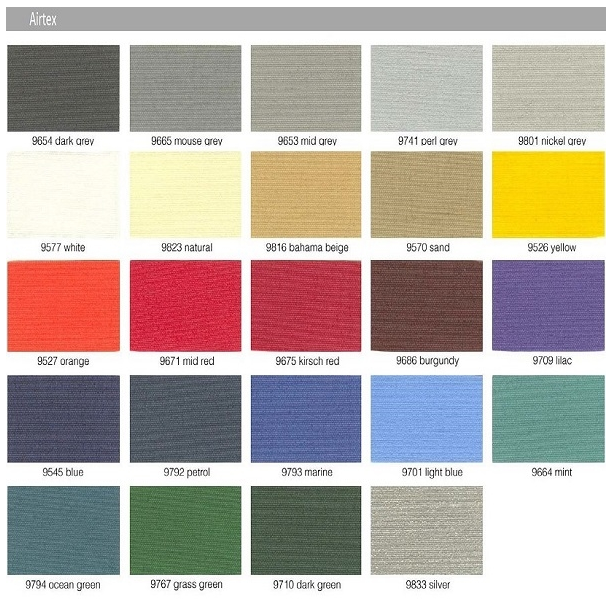 The fabric itself is a high grade Dickson or Orchestra acrylic fabric with valances as standard. It is also optionally available without a valance or using an Airtex fabric. Side sheets are also available, to enclose the parasol and ensure the users are protects from the weather as well as protecting the parasol and fabric when not in use. As well as being available in a vast range of colours, we also do special printing with no minimum order quantity, enabling you to get the exact look and branding that your business requires. Heating is provided by a number of infrared heating systems. 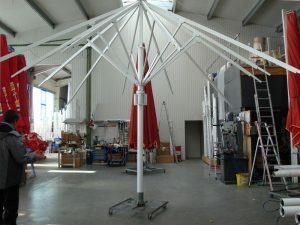 Up to 4 heaters can be put on a Jumbo umbrella with power ratings from 1.3kW to 2kW.